I have a soft spot for Swedes in advertising, so I'd like to welcome you all to the site. Thank you, Toad, for a remarkable blog, a much needed voice of dissent amidst all the new age digital hype out there, and an all in all inspiring read. I'm enjoying it as often as I possibly can. Thanks for being welcome here, Toad. 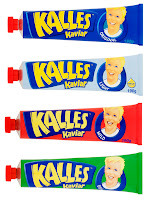 But what about the Kalles Kaviar - is that the best you got on us Swedes? @Dan: Much appreciated. It's good to hear that the word is getting out. @Martin: A Swedish friend suggested the Kalles Kaviar - it's an unknown here in the US. I've actually had it, on a slice of hard-boiled egg. Quite tasty. And the genesis of the name of the band Abba. Or so I'm told. Nope, ABBA (the band) stands for (A)nni-Frid, (B)jörn, (B)enny and (A)gnetha. Thank you. Just recently came across your blog and it's a pleasure to read.